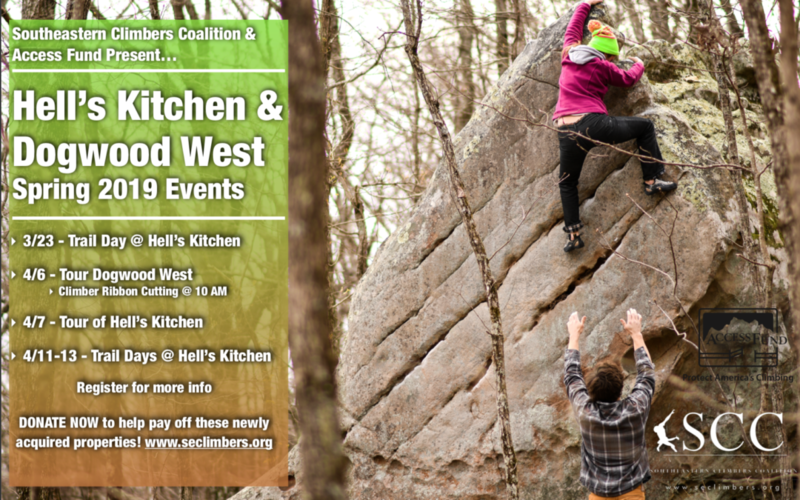 Join SCC, Access Fund & the Access Fund – Jeep Conservation Team for stewardship and climbing at the newly acquired Hell’s Kitchen and Dogwood West Boulders! Tours – Learn more about the boulders and how to get around! Join fellow climbers and Access Fund Southeast Regional Direct Zach Lesch-Huie for a tour through the boulder fields. Meet at trailhead at 10 AM with shoes, chalk and pad (optional). Climber Ribbon Cutting – April 6th @ 10 AM – Celebrate the acquisition of Dogwood West and Hell’s Kitchen! Please register for complete event information and updates. Donate NOW to help payoff the acquisition!